Zika virus is spread to people through mosquito bites which makes it a part of the group of arboviruses. Symptoms of Zika can include fever, rash, joint pain, and conjunctivitis (red eyes) but not necessarily all of them. Many individuals infected with Zika often do not realize they have it because the illness is usually mild and the symptoms overlap with other more common diseases. Symptoms usually last from several days to a week with severe disease that requires hospitalization uncommon. CDC has issued travel notices for people traveling to regions and certain countries where Zika virus transmission is ongoing. Mosquito season is upon us and everyone should take appropriate steps to protect themselves and their family. The majority of mosquitoes will be nuisance mosquitoes, NOT disease carrying mosquitoes. Precautions to prevent mosquito bites should still be taken however. Dusk/Dawn- Avoid being outside during dawn and dusk when mosquitoes are most active. Fort Bend County Road & Bridge and Health & Human Services departments actively monitor and control the spread of mosquito-borne diseases. For the latest information regarding the Zika virus in Fort Bend County, click here. in babies when the mother is infected during the first or second trimester of pregnancy. Current, recommendations for pregnant women and women considering pregnancy center around living in or traveling to areas where Zika is transmitted locally. Currently, Fort Bend County has had no local transmission of Zika but there have been several cases of Zika in the county due to travelers returning infected with the virus. The only local transmission of Zika in Texas was this past winter in Brownsville, TX with two cases reported. If you are pregnant or considering getting pregnant it is recommended to avoid travel to areas where Zika is being transmitted. If you need to travel to an area with active Zika transmission, please read this post on Zika Prevention. As the temperature rises the risk of Zika increases in Fort Bend County due to increased Mosquito activity. The increased risk is illustrated on the animated map through the changing color of the circles for each month. 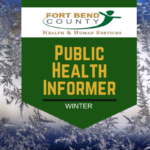 *Fort Bend County Health & Human Services is responsible for disease reporting in all of Fort Bend County with the exception of the areas within the City of Houston. Note: For 2017, as of June, no Zika virus cases have been reported to Fort Bend County Health & Human Services. As of the week ending July 28, there have been 19 Zika cases reported in Texas for 2017. From December 2015 through December 2016, 323 cases of Zika virus were reported in Texas. Only six cases diagnosed were from local transmission all in the Brownsville, Texas area (Cameron County). The remaining 316 cases in Texas were travelers infected in other countries and diagnosed after returning to Texas. Two cases involved having sexual contact with someone who acquired the Zika infection while traveling abroad and three cases passes from mother to child before birth. For those planning travel to the Brownsville area the CDC has issued travel guidance. Updated Case Count Information can be found on the Texas Department of State Health Services’ Website by visiting the following link: texaszika.org. The primary vector (mode of transmission) for Zika is the Aedes aegypti mosquitoe. 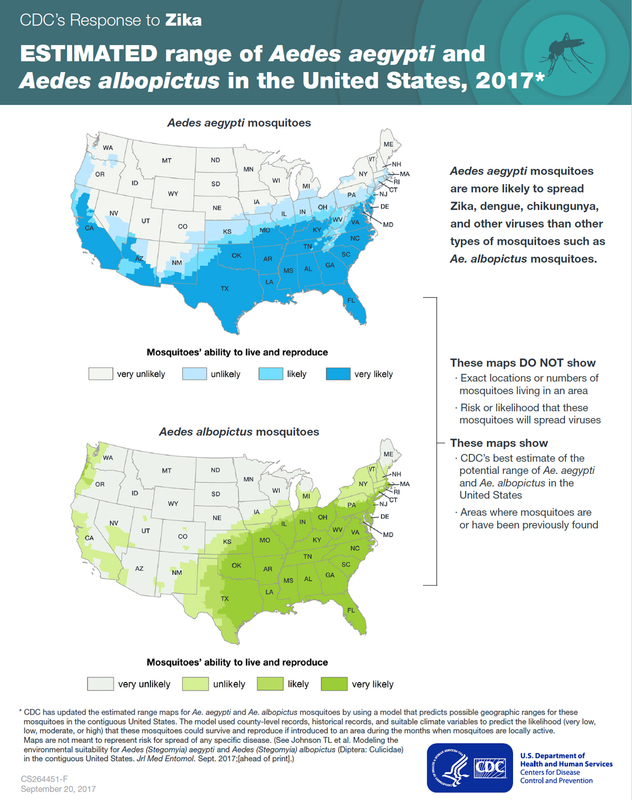 Areas of the U.S.that have this mosquitoe or have observed it then are areas that could have the virus transmitted. The map below provided by the CDC shows where this mosquitoe has been previously found in the U.S. However, the map only shows where the mosquitoe lives and not where Zika has been found. The following map shows places in the U.S. that have had patient diagnosed with Zika. Only Texas and Florida have had local transmission with the remaining cases diagnosed in returning travelers. Prior to 2015, Zika virus outbreaks have occurred in areas of Africa, Southeast Asia, and the Pacific Islands. Currently, outbreaks are occurring in many countries. The Zika virus continues to spread and local transmission has been reported in 72 counties so far.